Jessica stands in her underwear in my bedroom, brushing her hair with my brush. She’s a small, pale despot in polka-dot pants. I nod, and blink mascara into my eyebrows. Daddy bloody does, I think, but don’t say. It takes forever to get her into her new frock. She kicks off at wearing her patent school shoes, but I tie ribbons on them, to look less schoolish. We go downstairs, and the puppy freezes mid-launch when we all screech. Dora doesn’t even bother getting out of her bed – she knows best frocks mean hysteria and vertical pats. We arrive at Hornton an hour before the Parade, because I love ferreting around the White Elephant and the second-hand books. My stomach actually squirms with the anticipation of what I might find. Hornton looks as beautiful as ever, aubretia frothing from walls. Red and white tulips stand in serried ranks, like ready-filled wine glasses at a summer party. Stevie drops Ellie, Jess and me off, then goes off to find somewhere to park. I streak down the hill, desperate to score before Stevie can find me and ride me off. I look around for the children, but they’re gone, vanished like lurchers to filch cakes from their friends’ mummies. ‘Carles!’ I hear, and the next moment I’m kissed by a bevvy of mates, all in pretty summer dresses, toe-nails painted. Once there, I’m instantly transfixed by the possibilities of fabulousness. The chipped jug that would be gorgeous full of pink campions. The grimy oil painting that might just be School of Turner. I manage to purchase a metal colander with a long handle, a reproduction horse brass and a fish kettle. ‘Gotcha,’ says Stevie, grabbing my waist. He’s too late, I’ve paid, and I’m on a high. ‘Oh look!’ I say. ‘There’s the Curdies!’ Stevie goes to say hello and I beetle over to the books. In less than a minute I’ve selected 6, and I pay £4. One of them is a Nancy Mitford, and I’m practically hyperventilating. I blanch, and Stephen reappears to confiscate my sac magique, the weight of which is bending me almost double. Bad-mummy guilt makes me ball Jess out when I track her down on the bouncy castle. ‘Bloody bouncing in bloody fifty quid dress!’ Jessica takes my hand as we storm up the hill to the Joiners. She looks so sweet and pretty that I stop and sweep her up and kiss her neck, just below her ear. She laughs, because she knows that today she’s enchanted, and all-powerful. We meet parents coming down the hill, having left their children with the brilliant Ian Harris, and whom the children call the May Day Man. We all exchange smiles at being part of such an ancient thing, in such a beautiful place. Jessica tows me onwards, before I can talk to anyone. With relief, I see Ellie’s already made it, standing looking cool with her nine-year old buddies. ‘She’s here!’ cries Mrs Joiner, catching hold of Ellie. Jessica disappears beneath a faded red velour curtain, then emerges a proud un-crowned Queen in a regal velvet cloak. She holds her head high and to the left, as if about to waltz. Her little King, Jack, comes to stand next to her, sweet in his white shirt and dickie-bow. I catch the eye of the King’s mother, and we both grin. Our children have known each other practically from birth, and were born, in fact, two weeks apart. They belong so completely in this village, in this parade, on this day. I kiss Ellie for luck, then run off down the hill before I can cry. 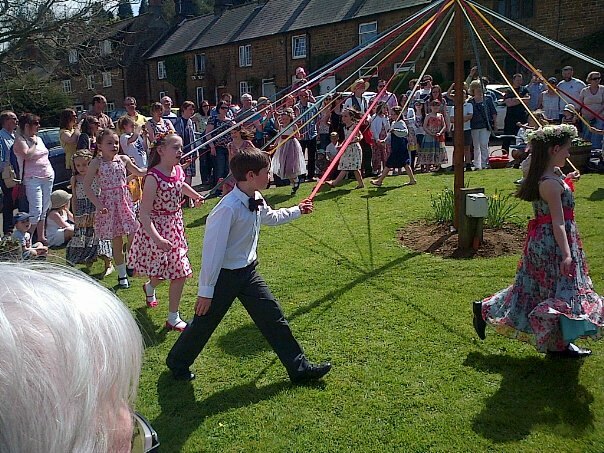 There’s been May Day dancing in Hornton for over 100 years, and the children have always followed a musician to parade down the hill to the village green. They walk slowly, with immense pride, beneath arches of pink and white blossom. The weight of that history makes me shiver, and I think of Rupert Brooke, ‘dust whom England bore, shaped, made aware’ – I wonder how many share memories of May Day, and which of those children still live, and whether they lived to be old and watch their own children come down the hill. The crowd around me is shifting now, and there’re ooh’s and clapping. 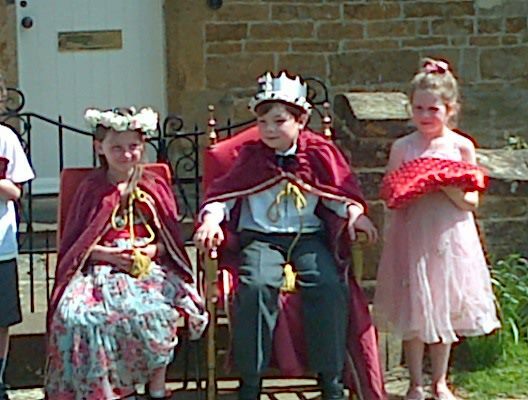 Mr. Whitehead is playing his accordion and Keenan and Megan, the lead blossom bearers appear, closely followed by Jessica and her King. Both are poker-faced. The parade solemnly troops straight past the thrones and heads for the May pole. ‘Every year,’ says Mrs Joiner, as the parade buckles, then reverses. A Hornton bigwig gives an inaudible speech, and everyone claps him because he’s such a nice man. Then the children are crowned, and Jess’ face splits into her biggest, most chuffed grin. Her crown is made of white roses, studded with pink carnations, and twists of baby breath. She sees me and waves, then pokes Jack in the ribs to whisper something that makes them both giggle. Stevie squeezes my shoulder and I tread backwards onto his toe. ‘Photos, mummies!’ comes a call, and then there all off again, to start the dancing proper. The ribbons – pink, green, blue, buttercup-yellow – are tent-pegged to the grass to stop them fluttering in the breeze. The music starts up and the children are handed their ribbons, the tent pegs carefully collected. The dance is announced, but I don’t catch it, trying to eavesdrop on Stevie and a Horley husband discussing drunken escapades. The tunes are timeless, belted out to bounce off the golden-bricked walls around us. The smell of barbecued sausages are driving me mad. I turn around to Stevie, but can’t see him. Ellie is dancing now, looking very serious and trying to ignore the barracking from the rest of her class sat round the edge. The catcalls are led by Archie, whom she adores. Stevie reappears with a pint of bitter, and winks at me. ‘Arse,’ I mouth. He toasts me, and takes a long gulp. The last dance begins, and husbands start wriggling off pub-wards. The Pees have arrived, and I tell Mum we must go and have afternoon tea in the school. The music finishes and we all clap as the children bow and curtsey and then leggit before their parents can re-capture them and make them go home. The ribbons are caught by the wind and soar joyfully for a moment, before tangling themselves around their May pole. May Day is in no way winding down, and there’s still the Morris Dancing to watch and stalls to visit. I feel the pull of the White Elephant again, but my dad takes my arm. ‘No more crap, Carlie.’ My mum hastily looks away from a soup tureen I know she admires. Stevie’s disappeared again, and we go to eat chocolate cake and drink very brown tea. I whisk away in yellow Marigolds, chattering, laughing, but feeling that nudge of history again. A mountain of orange-red used teabags smells like my childhood, playing behind the scenes at fundraisers whilst my mother brandished giant brown-enamel teapots. I slosh washing up liquid, and agree that fairy cakes are nicer than cup cakes. Eventually, I sit with the Pees, and gobble my slice of cake before my dad can pinch it. Stevie turns up with another beer, and we sit in the afternoon sun, watching the crowds go by. Jessica turns up with her mate Ruby, and they show us their giant gob-stopper dummies. I laugh, because shake-a-leg always makes me think of a man who’s peed on his own trousers. Stevie starts listing our friends who are in the pub garden, and we kiss The Pees goodbye and start drifting that way. There’re so many people our progress is very slow, and somehow we’re separated. I stop to admire a baby in a pram, and realise I’m barely yards from the White Elephant. I spot a fractured standard lamp, and start to sidle over. My friend with the baby wheels with me, and suddenly we’re there, next to the lamp. I nod and chatter, so casual. I feel my Emergency Fiver, hidden from children and Stevie in my cardigan pocket. I manage to slide it out and pass it to the nice chap manning the stall without anyone noticing. Stevie strides into sight. The nice chap quails, and disappears. My friend with the baby is accosted by another friend with a baby. ‘It was a pound,’ I say, hopefully. ‘I’ll give you ten to leave it here! Come on, come on. Pub! Now!’ And he frog marches me away. Much later, we drive home to Horley. The children are exhausted, Maypole-axed with sugar, heads lolling in the back of the car. Jessica’s crown is skewed over her left ear. Ellie has candy floss in her hair. We pull up at our house, and everyone clambers wearily out but me. ‘What’re you doing?’ asks Stevie, unloading my previous bounty. I wait until he’s shut the boot before putting the car in reverse. ‘Back in a bit,’ I cry. He swears at me in disbelief. Ah, thanks Nicky. Probably wouldn’t have put it up if you hadn’t said you wanted to read it! So glad you took the time to leave a comment on my blog the other day because now I’ve discovered yours, and I love it. I love the way you tell a tale. And this one about May Day made me feel terribly nostalgic for England! Especially the May Pole (I have a vague recollection of being forced to May Pole dance at my junior school in the seventies)! Hello Mrs Clay – thank you! How funny to make you nostalgic – you did the same to me! My daughters are 9 and almost 8, and even though yours are just a bit younger, it already feels like a long time ago. Imagine our daughters reading our blogs when they’re our age – serious mind-mess!